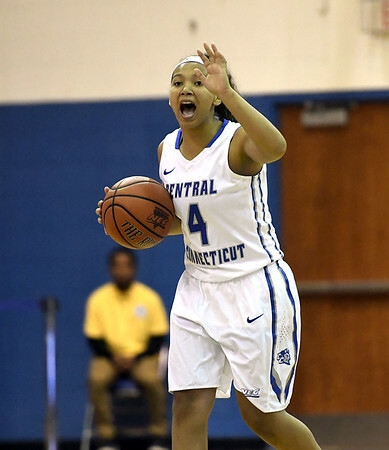 In a close game that featured 12 lead changes and 12 ties, the Central Connecticut women’s basketball team came up just short against the visiting LIU Blackbirds on Monday night. LIU (8-10, 4-3 NEC) snuck past the Blue Devils 61-54 after outscoring CCSU 20-11 in the final 10 minutes. Central (2-15, 2-5 NEC) was led by junior , who dished out a career-high nine assists and added 14 points. CCSU took an early 12-5 lead on a 10-0 run to start the contest, sparked by two three-pointers from graduate transfer . LIU’s Drew Winters ended the run with a trifecta of her own with 3:24 to go in the first quarter that led to a 8-0 Blackbird run to end the period. The Blue Devils and the Blackbirds played an even second quarter and were tied 23-23 at the half. Sophomore hit 2-of-2 form the foul line to start a 7-0 Blue Devil run to open up the largest lead of the game for either team, 53-45, with 6:03 left in the game. CCSU will go on a three-game road series next, first taking a trip to Pennsylvania to take on the Northeast Conference’s two leaders, SFU and Robert Morris. Central will see the Red Flash on Saturday, Jan. 27, at 1 p.m. and the Colonials on Monday, Jan. 29, at 7 p.m.
Posted in New Britain Herald, CCSU on Monday, 22 January 2018 22:50. Updated: Monday, 22 January 2018 22:52.